Chernobyl - What Have We Learned? Twenty million people have been exposed to Chernobyl radionuclides through the Dnieper River aquatic pathways. This book presents a 20-year historical overview and comprehensive study results of the aquatic environment affected by the 1986 Chernobyl nuclear accident. During this time, many water quality management practices and countermeasures were enacted. The book presents in-depth analyses of these water remediation actions, using current science and mathematical modeling, and discusses why some were successful, but many others failed. The chapter entitled Where Do We Go From Here? incorporates a comprehensive discussion of the planned New Safe Confinement (NSC) structure to cover the Chernobyl plant. The book closes with a summary and conclusions drawn from these analyses, making it a valuable reference tool for the future. 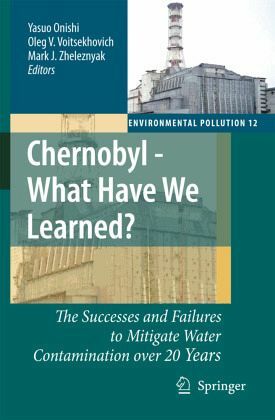 In addition, the detailed, almost day-to-day, emergency responses to the Chernobyl accident described in this book will also be useful to people developing emergency and long-term responses to accidental or intentional (by terrorists) releases of radionuclides, toxic chemicals and biological agents. - Soviet-Built Nuclear Plants and Their Safety. - The Chernobyl Accident and Its Aquatic Impacts on the Surrounding Area. - Radioecological Aspects of Water Use. - Population Dose Estimate Due to Aquatic Pathways. - Radiation Risk Assessment and Countermeasure Justification. - Management of Fresh Water Environments in Chernobyl Affected Area. - Water Protection Measures for Radioactive Groundwater Contamination in the CEZ. - Where Do We Go From Here? Construction of the New Safe Confinement.